I have been trying to figure out the theme of my blog. What’s my niche? What do I want to impart on my readers, so that they leave having gained something from my ramblings…Why am I here…?? Then it hit me, I am the queen of “make it myself”, so why not, from time to time, allow my readers to find ways to remake some of the processed crap we buy in stores, under the guise of “convenience”?! 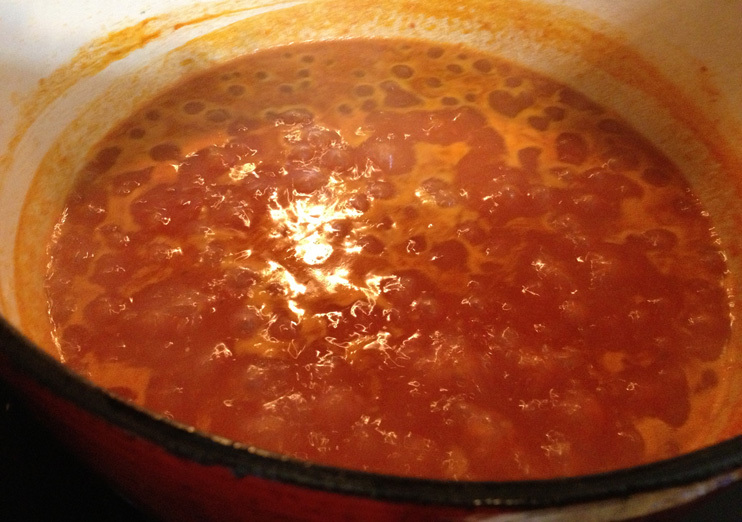 It is in that vein that I am sharing this recipe for a tomato reduction, that will make you wonder how you could have ever eaten the mess in the can. (No offense to the makers of the stuff in the cans…but nothing can erase that tinny aftertaste). This is a fairly easy recipe, it is just time consuming. It is a labor of love and well worth it, but definitely something to do when you have time to spare. The process takes roughly 90 minutes, to two hours to complete, and you will get antsy, and you will wonder what’s going on…why isn’t this working??? Then, you will look in the pot and go OMG! It’s working!! Gather all of your ingredients. 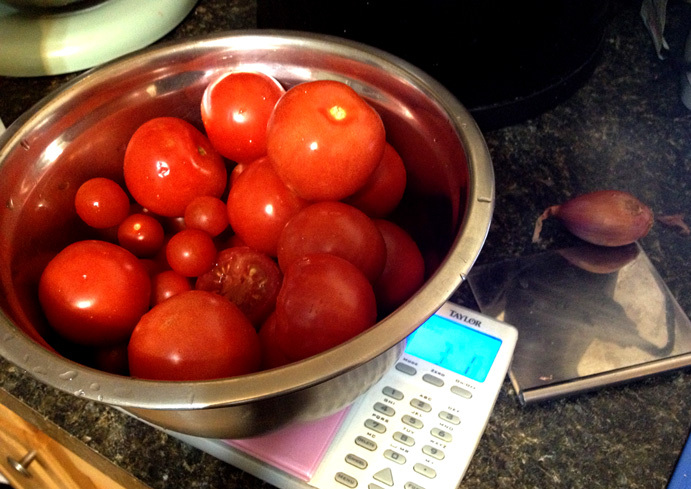 I just grabbed all of the tomatoes I had in the house and used them in the recipe. As you can see, I have some Grape, Campari and Roma Tomatoes. I just cut off the “offensive” portions. 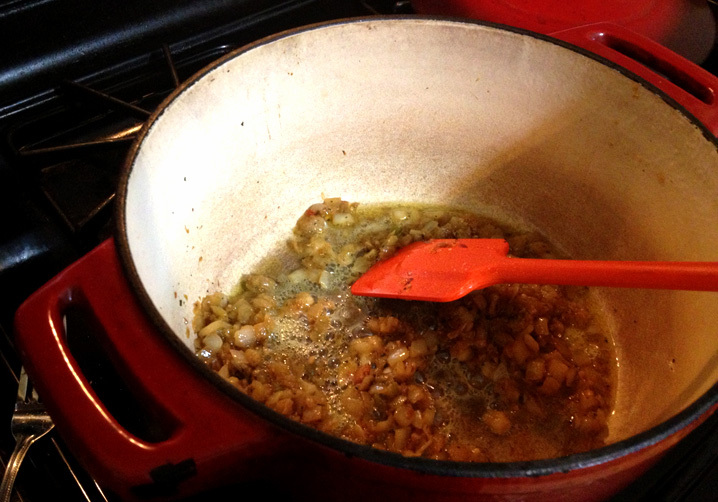 In a large heavy bottom pot (I used my enamel coated cast iron dutch oven) heat olive oil. Add onions and garlic and a bit of sea salt, to draw out the moisture. Cook until soft. Cook on medium low heat, so that it cooks slowly and doesn’t burn. 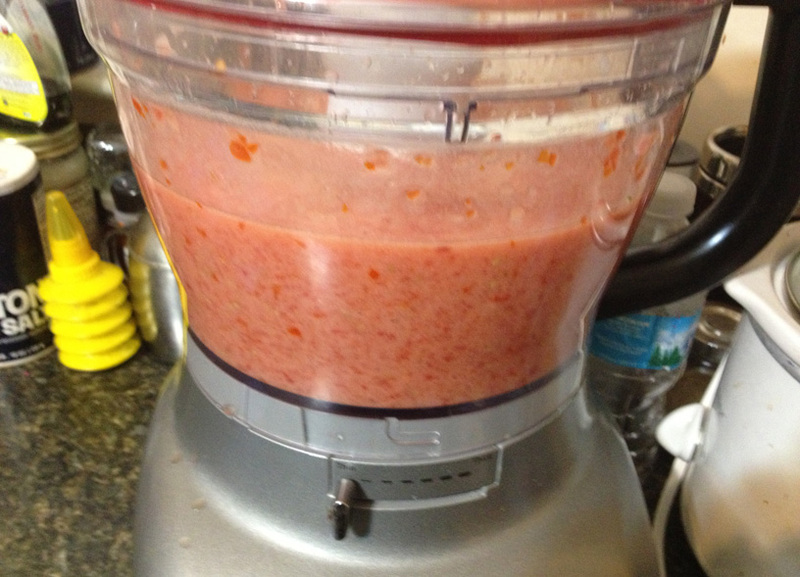 Meanwhile…Roughly chop tomatoes and puree in a food processor or blender. If using a blender, you may need to do it in two or more batches. Add sauteed onions and garlic to blender and mix in with tomatoes. It will look like a weird pink mess O_o. Add mixture to heated pot, add a bit more salt (depending on your preference, but not too much) and turn the eye on high to bring the mixture to a boil. Now comes the fun part…the wait. Turn the down to medium and simmer. It will begin to thicken and the color will begin to darken. You should start getting that rich roasted tomato aroma in the air. At this point, you will begin the process of stirring, and waiting, and stirring, and waiting. 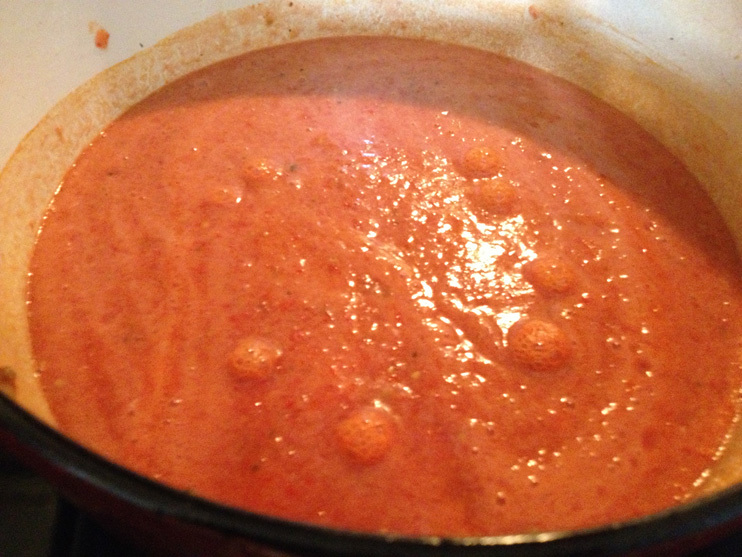 I let it cook for about 5 minutes, then stirred, then cooked again, then stirred…you get the picture. Notice how it’s reduced down from the original amount? Now guess what?? We cook and stir and cook and stir some more. What’s going to start to happen, is the mixture will get thicker as it cooks down. It’s going to bubble and pop, so you may want to cover the pot if necessary. 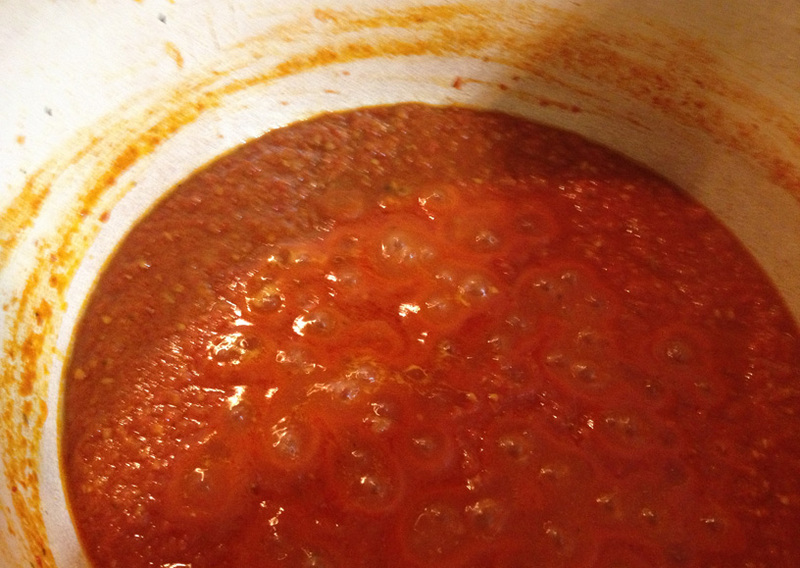 As it gets closer to the paste like texture, you will need to stir more frequently, in order to prevent burning. When the paste starts to pull away from the pot, and has an almost dough like texture, guess what??? IT’S DONE!! Yay! 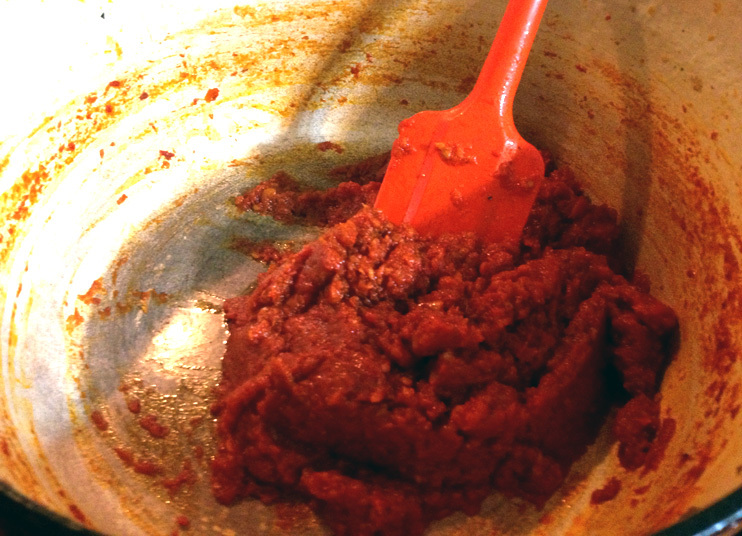 Paste can be refrigerated for two to three weeks, or frozen for up to six months. I store mines in a mason jar and use as needed! 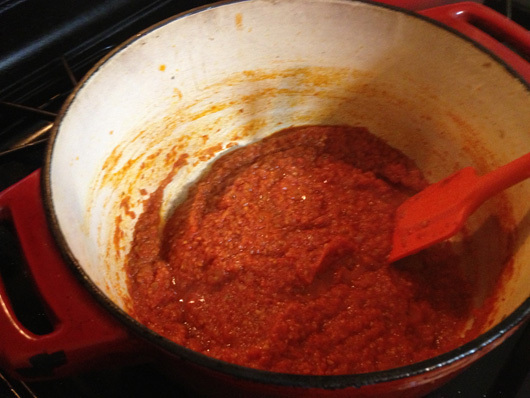 3 Responses to "Tomato Reduction – My version of Francis Lam’s recipe from Gilt Taste"
I am looking to make a sauce for pulled pork. I simmered it in a porter and reduced (reducted?) the beer, but it was bitter. I wil try this. What kinds of things can I use this for once I try it Kita… I am teaching myself to eat cleaner, by not eating processed foods.. Can I use this on pizza? or fish? 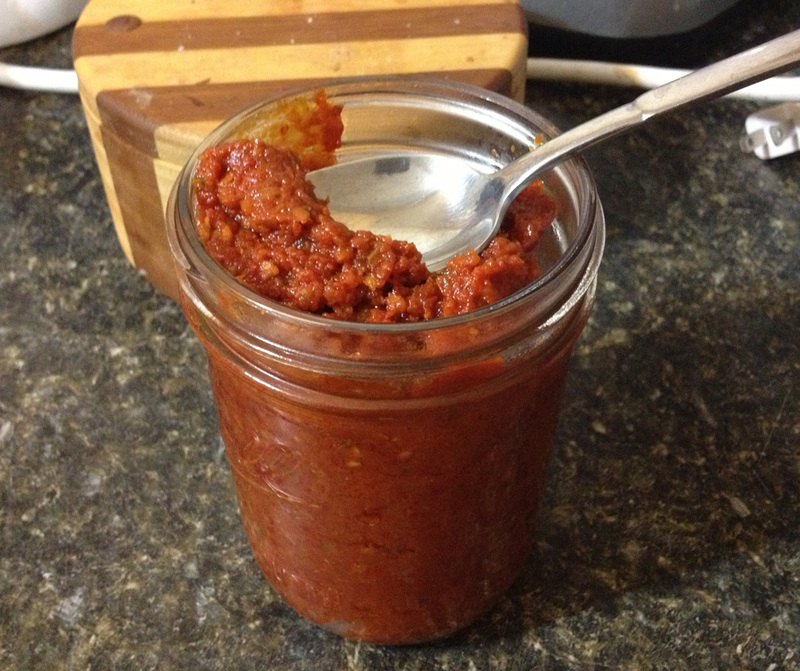 You can use this in any recipe that you would normally use Tomato Paste in. If you add it to sauteed vegetables and add a bit of white wine or chicken broth, it makes a really good sauce for chicken or fish.